Awful Bad: Vintage Wood / Coal Cast Iron Cook Stove. Vintage Wood / Coal Cast Iron Cook Stove. theAd>>Phillip & Buttorff Mfg. Co. Nashville Tenn. Henry W. Buttorff born 1837 Started the first stove and tinware co. in Nashville Tenn. in 1881 One of the largest concerns in the United States at that time. He ran the business for 36 yrs. I am not sure if a family member took over at that point or if it was sold.Has Two Side Doors and a Rack for Baking pies or Corn Bread. Stands 28" Tall and the Four Burner Top is 25" Wide X 31 1/2" Deep. Has some rust, soot and grease. Needs cleaning and stove black polish.Sold as found. $275.00 CA$H ONLY in person! No Scams. No Shipping! I will help you load it on the back of your pick up Truck. 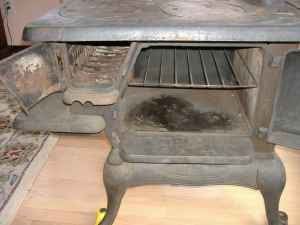 I will list this stove on eBay on 12/21/08 @8pm. if not sold here.So buy it now and bet the rush. This is great for a Shop, Hunting Cabin or as a back up in your Home when the Power goes out.Go Green Cook / Heat at the same time. Those Long Cold Winter Nights are here. Great Christmas Gift. Maybe for yourself. Pat, here is the thing. If [as I have always believed] electric appliances are bad gift, then a gift that means you have to chop wood is a TERRIBLE gift. As we all know from SNL, Pat is a gender nuetral name but I am just guessin' you're a dude. And when you say "Those Long Cold Winter Nights are here" It's because you brought this home as a "gift"...riiiiiiiiight. Labels: Makes a Great Gift?, Useful?